Take a look at the new season colours in Sheepskins. A great way to add new colour to your home. Brightens up a bathroom, bedroom or living area. Looks fantastic in a garden room, conservatory or just simply on your garden furniture! 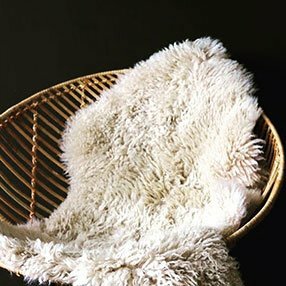 Sheepskins are an incredibly versatile product for the home, which Collective offer in a huge range; both in their natural state and, also in a variety of colours and sizes, bringing a beautifully textured, outdoor product into your home. Our sheepskin rugs are available in different varieties; Curly, Silky, Icelandic and Tibetan. Larger sheepskins are carefully sewn together to create different sizes and configurations, which can be used as floor coverings. Single sheepskins can be used in a variety of ways: placed on dining chairs, pet beds, Moses Baskets, sofas, armchairs, benches and outdoor furniture – let your imagination run riot! They can also be used in bathrooms as bath mats and of course as rugs throughout the home. Additionally; a lesser known fact; they are even washable! Sheepskins look great and are luxuriously comfortable underfoot or to sit on. Collective only stock premium quality, ethically sourced items that have been carefully processed to preserve their natural beauty and individuality. It’s a strong look! Interior colour palettes have been moving towards darker shades, Greys have gradually turned to Charcoal, Dark Blue and Black. Great for walls, creating a dramatic ambience with the help of accent lighting, velvet furniture, touches of mixed metals and large florals. Provides a great background for hanging pictures and photographs. Awaken your senses with collective locally made home scents range. Collective have been working on their home scents range, locally made in Warwickshire, adding 3 new fragrances to the collection. The range now has 5 beautiful fragrances. In order to let the scents do the talking, they are named simply, No 1 2, 3, 4, and 5 and are here to be discovered, at No 37 Park Street, where their beautiful aroma lingers…. No1 scent is an uplifting blend of sweet aromatic woody oud, oozing fresh coriander, zesty lemon grass and ginger that lasts and lasts and lasts. Perfect for day. No2 scent is a sophisticated yet relaxing blend of East Asian smoky vetiver, fragrant woody cypress and provocative black pepper. Perfect for evening. The two can also be combined successfully to create the best of both worlds. No 3 scent is a delicious blend of grapefruit, bergamot and geranium, perfectly balanced to restore mind and body . No 4 scent is a refreshing fusion of lime and peppermint, specifically designed to energize, invigorate and cleanse the senses. No 5 scent is an earthy, spicy fragrance combining patchouli, frankincense and cardamom, to induce a sense of deep, lavish relaxation. Relax, recharge or indulge – you choose! We stock a range of ethically sourced, beautiful quality sheepskin rugs and cowhides. A sheepskin or cowhide can add a touch of luxury and is a great addition to your home. Discover our tannery to view the collection. For style tips and trends take a look at our blog. Carine Harrington, interior designer of Boutique Homes and Liz Downton, a former director of Chalet Chic joined forces in November 2014 to create this fantastically eclectic home interior concept store in Warwickshire. Looking for off-beat, quirky, home furnishings and home décor ideas? You’ve arrived. Collective, the online and retail homewares store, is an eclectic treasure trove of leading edge furniture, lighting, home and garden accessories, designed to delight and excite. Try something different! Enjoy spending time in our 2500 square foot lifestyle store, a converted metal fabricators in Leamington Spa.Love our unique products, listen to our cool playlists (Shazam at the ready) and experience a fun in store vibe. Only 1 hour 20 mins from London and 35 mins from both Oxford and Birmingham.Make Collective Home Store a regular haunt, when you are next in Leamington. Pop in to see whats new! Our stock is always changing. Find out what we are listening to! Enjoy our store playlists, we have one for every mood as well as some great new music! Designer frames and fashionable colors… comfort and style now go hand in hand. Izipizi READING glasses collection is designed with magnifying lenses, rubber feel, flexible hinges. Izipizi SCREEN collection protects your eyes by filtering 40% of blue light emitted by computer screens, smartphones, tablets, TVs, etc). Aged 3 – 10 years 100% UV Protected.